Last week Eitan Suissa, a 12th grade student at YBA Yavneh in Haifa, was elected by the representatives of 35 municipal high schools in Haifa, to chair the Municipal Youth Council. The snap election was called for when the previously elected chairman suddenly resigned his post. Eitan had been serving as the Youth Council's spokesperson until being drafted by his peers to the chairman position. "Three years ago I came to the Haifa Youth Council as the representative of my school with a desire to serve and faith that we, the city's youth, can be a driving force for change in the city," Eitan said upon accepting the chairmanship. "We have been privileged to represent, advocate for and provide for the needs of our city's youth. I plan to lead a policy of strengthening the unity and affinity between the various interest groups in the city, out of a faith that the only way for the future is through cooperation." 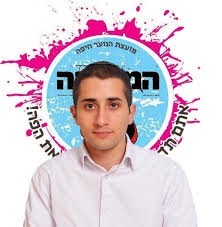 By virtue of his position, Eitan will sit on the Haifa City Council as representative of the Municipal Youth Council. "It is a challenge for any 12th grader to make time in his busy schedule for such a heavy responsibility, but I'm sure that Eitan is up to the task," said the Rosh Yeshiva of YBA Yavneh, Rabbi Yoram Shamir. YBA Yavneh joined the Yeshivot Bnei Akiva educational network in 2008, at the request of the parent's committee after years of slipping enrollment and academic achievement. Approximately one third of the students require scholarship assistance due to financial need. Since joining the network the school has upgraded its secular and Judaic studies programs, and now serves over 300 students, with graduating classes achieving a matriculation rate of over 86%.